Aaron Martens says that the Davis Baits Shaky Fish, the latest incarnation of his multi-generational billed swim jig design, is the best in its class. What he’s less likely to tell you is the wide range of depths at which it can be effectively deployed. Up until now, his deep water Shaky Fish secrets have mostly been under wraps. The noted tackle innovator and 13-time Bassmaster Classic qualifier doesn’t necessarily want everyone to know that the Shaky Fish isn’t just for shallow water horizontal presentations. It’s easy to get the impression that that’s where it would shine, since fluke-style plastics are among the most oft-used trailers for this class of lure, and those lures are most frequently used for shallow applications. But to Martens, limiting this bait to 10 feet and under is a grave mistake. While it can serve as a replacement for those two classic bottom-bumpers, it really shines in places you want to fish a crankbait, but can’t, simply because no lipped crank can get down deep enough. With a ¾ ounce Shaky Fish (or even the new one-ounce model he’s working on), the only depth limit is the amount of line you have on your reel. It’s been a key deep lure for him in tournaments at Pickwick and at Kentucky Lake. At the latter venue, nearly every fish he weighed in over three days came on the bait that he perfected. The second key retrieve is employed “when the fish are really chewing,” he said. Once again, he’ll make a long cast, but this time he lets the lure sink with the reel in free spool mode. Once it hits the bottom, he’ll jig it with sharp upward jerks, much as he would with a big structure spoon. It’s not just a technique that’s good for when fish are positioned on a particular shell bed or brushpile. 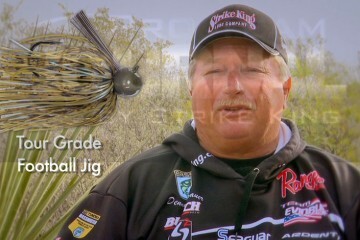 Even when he doesn’t catch them on it during the tournament, the Shaky Fish is often is prime search bait. Martens recalled his 2000 BASS Western Invitational win on California’s Lake Shasta as a prime example of how he uses it to break down offshore structure. He uses a variety of soft-plastic trailers, including shad imitators like a Fin-S-Fish or a small Zoom Fluke. A BassTrix-style paddletail swimbait is another common choice, although he noted that you’ll have to super glue it in place. One of his absolute favorites is lesser known – a twin tail spinnerbait trailer. He’s also experimenting with the use of a slightly thinned out spinnerbait skirt to add bulk and to change the rate of fall and level of water displacement. With all of the possibilities for customizing the basic presentation, he estimated that over the past year the Shaky Fish has produced 30 percent of his tournament catches. “I use it as much as I use a crankbait,” he said. With the braid, he’s had to go to a softer, more parabolic rod. His choice for this application is the rod that he’d normally use for lighter (1/4- 3/8 ounce) Shaky Fish, the Megabass Racing Commission F5-72XRC, a 7’2” stick in a 5 power. When he uses straight fluorocarbon, he prefers the F7-7X Aaron Martens signature series pitching rod, which is listed as a heavy action stick but he said is more like a traditional medium-heavy.